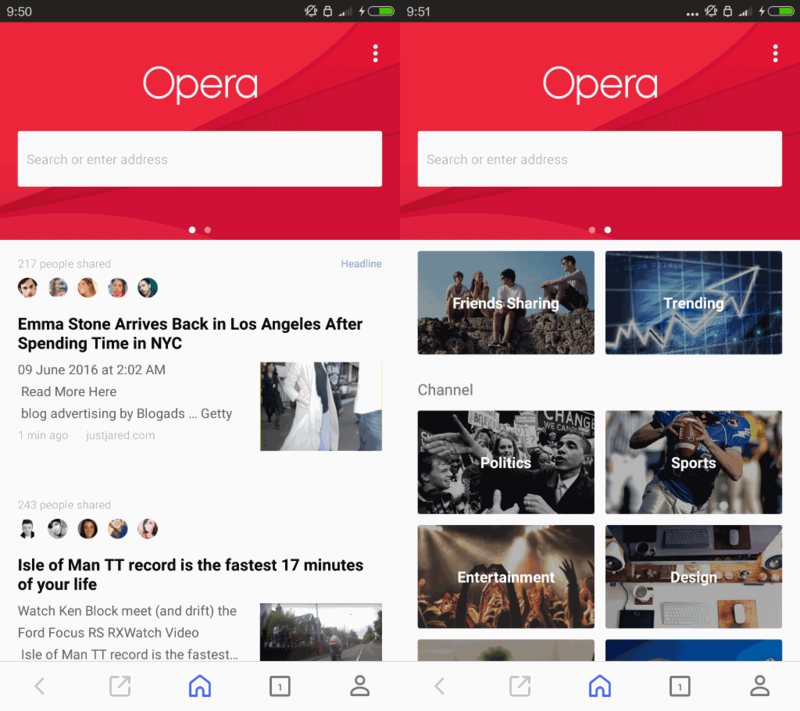 Opera Software launched a new application for Android devices called Opera browser - news & search that moves away from the classic web browser concept. The company has experimented with news feeds and personalized news in Opera browsers both on the desktop and mobile devices for some time, and it seems that the new app marks the next step in the company's journey. Opera browser - news & search is not a classic web browser anymore even though it comes with functionality to load web pages. 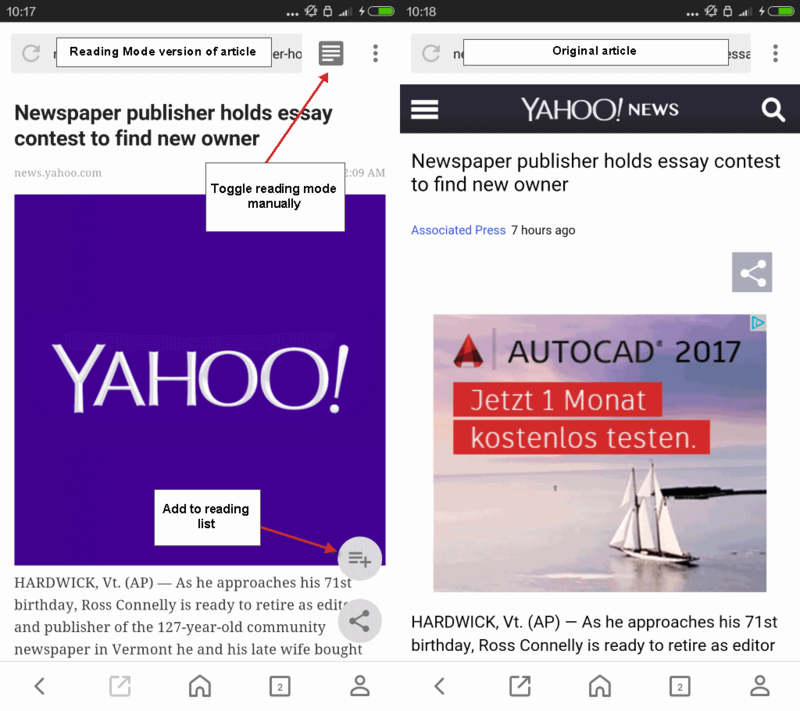 Think of the new app as a special version of the Opera browser that focuses on delivering news and providing search capabilities. This becomes apparent right on first start. The browser interface is divided into a search form at the top, and news below it. You can use the search form to run searches or type web addresses directly. Basic controls to go back, open the home page or switch tabs are provided at the bottom of the interface. The news part displays an assortment of news articles on the frontpage. You can customize what is displayed there by swiping to the right to display the available channels. These include sports, politics, entertainment and other topics that look like an extended version of what recent versions of the Opera browser for the desktop offer. You can preview any channel with a tap on it, and hit the subscribe button to add its feed to the frontpage queue. When you load an article from the news section for the first time you are notified about another feature that Opera baked in: reading mode. You may load articles in reading mode, a special version of the web page the article was published on, that focuses on improving readability by changing fonts and removing elements on the web page such as menus that are not required for the article. You may use reading mode on an article by article basis, or enable it as the default viewing mode for news articles in the application. Reading Mode is not available for all web pages or articles that you open in the app however. The app ships with a reading list feature that you can add any article to. You may access the list of saved articles at any time by tapping on the sign-in icon in the menu bar at the bottom of the screen. Please note that you don't need to sign in to use the feature. Reading mode offers sharing options to spread the word on social media sites such as Twitter or Facebook. Opera browser - news & search supports Opera's data saving technology to reduce data transfers when using the application, and options to download photos, files and articles to the device for offline access. The settings list pretty much the same preferences that the mobile versions of Opera browser do. If you use the Internet mostly for news and search, then you may find Opera's new application useful. It is not available in all regions right now though, and that is probably one reason why news are focused on the US currently. It seems likely that this is going to change with future releases though, and if you don't mind that, you find the download on sites such as APK Mirror. The name of the app is somewhat confusing as it is easy enough to confuse it with the regular Opera mobile browser called Opera browser - fast & safe. Additionally, it shows up as Opera with the default icon on the Android device after installation. Now You: What's your take on the application? Personally I not need that because I simply could use any RSS feed Reader or simply open it separately but this has some potential if they add more search engines and improve the layout. Something like in instant preview would be finde, because sometimes especially on small smartphones it’s a bit annoying to open another tab or load another page into the same tab. Something like a sidebar or with pictures. That’s what I’m still missing. Just like newspapers, I find the news that these types of services offer too bland and uninteresting. It is news for the masses, and that’s something I’m not interested in at all.